I have just finished my exams and I hope you guys liked A's fabulous Malay Mermaid outfit last week. I would probably say this is some sort of a bonus post for the monochromatic theme, but this time it is the complete opposite from the previous outfit. Beforehand, black was the dominating colour for the outfit and now... wait for it, wait for it... it's white. Truth be told, it is no secret that I love the colour white. There's just something about white as a colour, it just radiates and illuminates everything, plus it complements my skin tone (hence the biased viewpoint). I have decided to put up this outfit together during the autumn season, and my quest, for finding the perfect white sweater and white coloured pants, were not easy. I remember, I completed the outfit when I decided to visit Wearrior A in Coventry for a fine weekend and she absolutely loved it. The idea behind the outfit spurred into the existence, was based on to create such camouflage illusion. Few people have pointed that out, and guess what? You're on point! I worked with two photographers in order to showcase my snow outfit. The first photographer was with Amin Nordin and it was totally unplanned when he took the picture above! I was pretty happy with the outcome and do check out Amin's Instagram and YouTube account, not only he's an amazing photographer, but he's also an incredible singer! Feel free to listen to his latest cover of "I see fire" by Ed Sheeran. 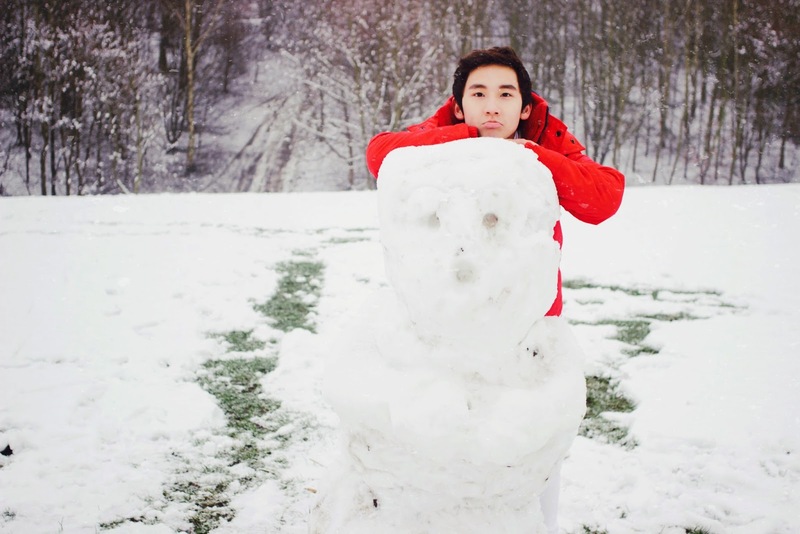 The second photographer was with Naqib H, he helped me recreate the photographs for the snow outfit perfectly! So, do check out Naqib's Tumblr to look more at his beautiful photos. I surveyed and looked endlessly for a really perfect white sweater. And one day, before I travelled to Coventry, I looked up on ASOS and saw this Pull & Bear's white sweater and instantly, I fell in love with it. 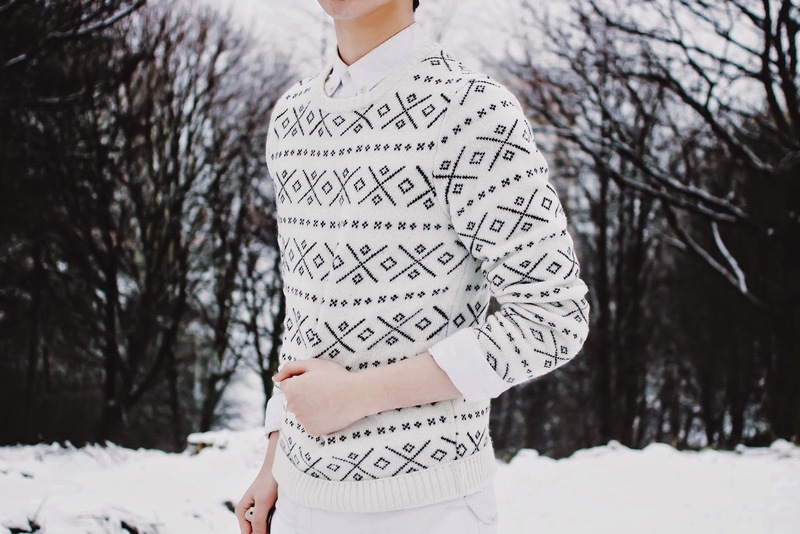 The pattern for this sweater is utterly stunning, just look at the photo, it speaks for itself. The colour is not exactly pure white, to be frank it's off-white. It's a good idea to have one clothing item with a different shade of white. Just for information, the sweater is really comfortable and it keeps me really warm, so I guess that's a bonus point! 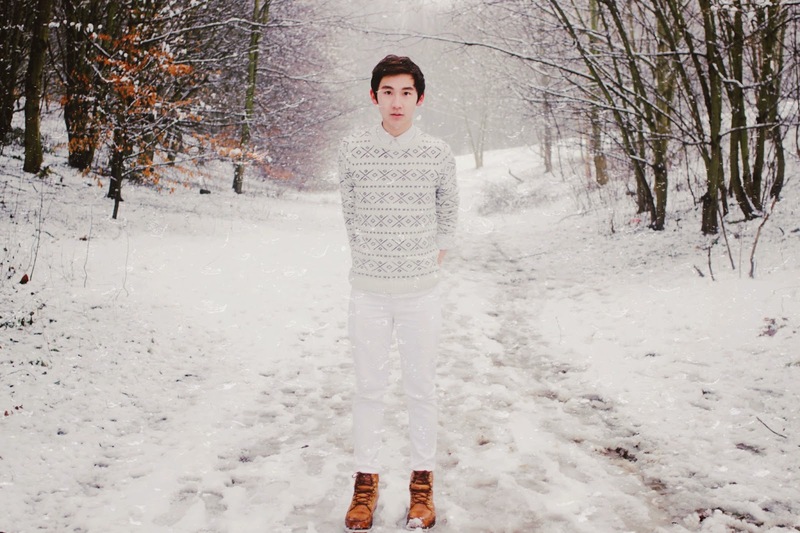 I matched an Oxford white shirt underneath it, to keep up with the snow theme. But I would also recommend a pastel blue or black to go with it, as alternatives because it would work really well. Consequently, it will produce another interesting outfit. Finding the right pants was quite tricky as well. My preference, if you're going for a really white shade, buy a white jeans because it is easier to clean. I had a white chinos before (emphasis on the 'had'). Well... I would not really recommend it unless it's off-white. Initially, I bought it from Zara. However, the fitting was not quite right. So, I got this white jeans from ASOS, which totally fits me really well. Just for your information, if you guys are afraid of wearing white, black coloured pants actually goes well with the sweater. So, feel free to choose. As for the boots, it's been featured in the previous two posts! I chose it again because it gives a superb contrast to the white clothing. Black or navy blue coloured boots would go with it, I wouldn't recommend white boots unless you really want to be completely camouflaged under the snow. 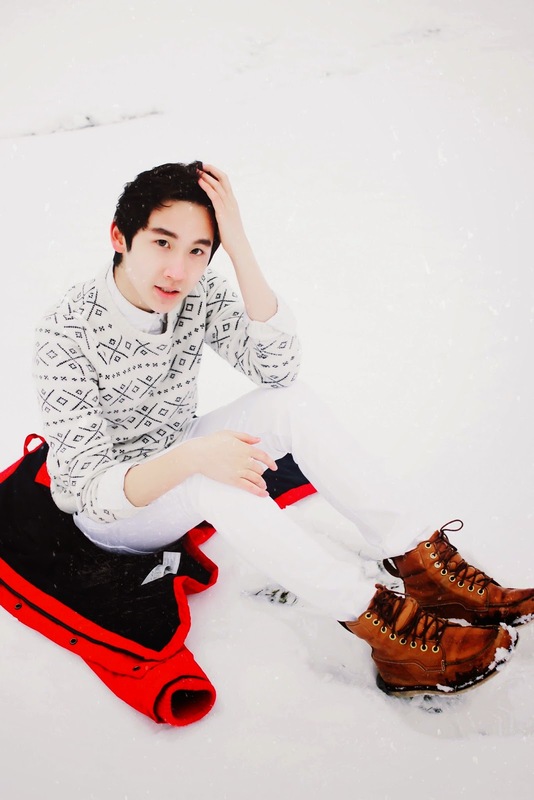 For this shoot, I have decided to use my Hollister bright red coat to go with the whole outfit. It totally added the finishing touch for the entire outfit. 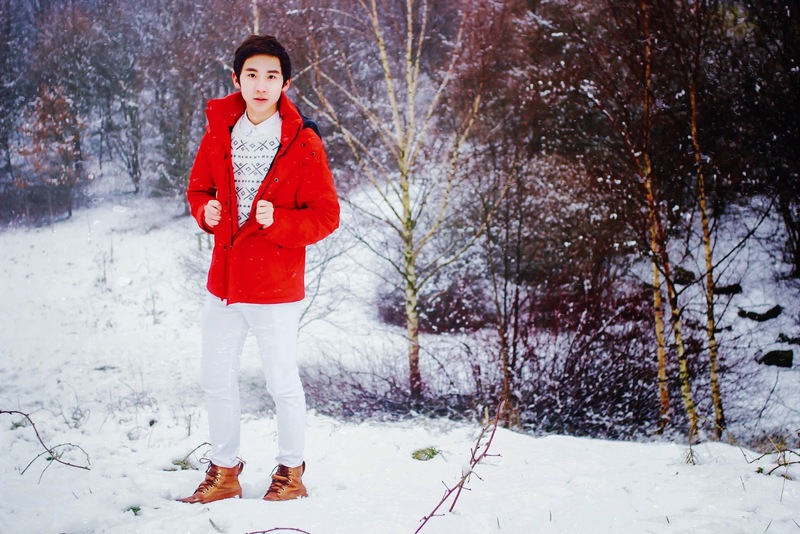 The burning red colour just pops up, as it is defying against the whiteness of the clothes, as well as the snow. Thank you for reading guys! Hope you guys liked it. So... do you guys want to build a snowman? No? Okay then... bye... until next time.